The American Meteorological Society (AMS) has just released its annual summary of the global climate, the State of the Climate 2016, written by nearly 500 experts from around the world. The results of this report not only confirm a common thought -2016 was the warmer year on record- but also show hair-raising data and climate anomalies that few people are talking about. The activities of human beings are increasing their impact in the planet year after year. In 2016, the annual global surface temperature increased for third year in a row, becoming the hottest year in recorded history – for now. And why should that matter to us? Because it means ice melting, sea levels rising, freshwater shortages for agricultural productivity and lack of food, which will arise more conflicts and emigration. We may survive to a temperature increase, but that’s useless if we don’t have enough food and water. 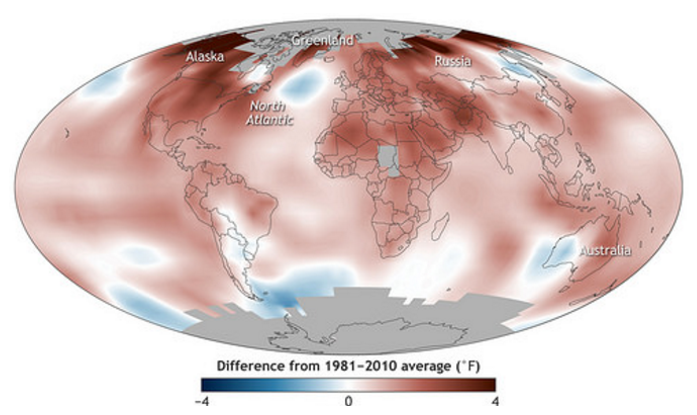 As the map below shows, in most of the planet regions, the 2016 average temperature was between 2-4 ºF higher than the average from the period 1981-2010. Twenty degrees is indeed hair raising.